by James E. Fields, Ph.D. The Olympic Games, long representing the global peak of athletics competition, included a 2500-meter steeplechase for men in 1900 and 1904. Many years passed before the adoption of present specifications including a sloped-surface water jump, world record recognition, age-class competition, and acceptance of women steeplers. Race distances have ranged from 1000 to 4000 meters, but only three common steeple distances (1500m, 2000m, and 3000m) are now widely contested and recognized in modern rule books. 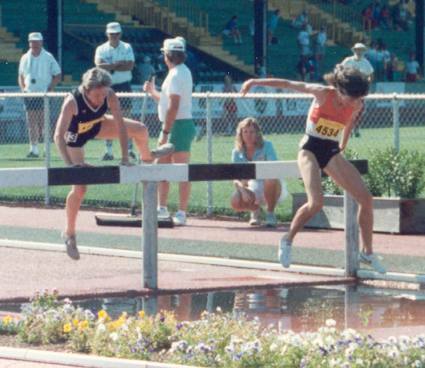 The World "Veterans" Championship steeple race for women on 5 August 1989 at Eugene drew 17 entrants from seven nations, ranging in age from 35 to 59. This race provided for many USA observers their first look at women's steepling. The World Veterans race was 2000 meters, using barriers set at men's height of 91.4cm (36 inches). These specifications were dominant for the first decade of female steeplechase including the 1994 Goodwill Games at St. Petersburg where Russia's Marina Pluzhnikova won in 6:11.84. The 2000m distance with 91.4cm barriers was also used in the USA during the early 1990s for female steeple competition in colleges and high schools, as well as women's national championships in most nations including USA. The 1500m steeple, with 91.4cm barriers, was also being contested at some small college meets in USA; that distance has remained popular elsewhere for both men and women steeplers. During the early years of female steepling, the event's publicity was sparse and not encouraging -- reminiscent of the early years for women's cross country and distance running. Yet there was continued growth, with talk and visions of inclusion for world championships and the Olympic Games of 2000. Such talk was encouraged by the Olympics' rapid inclusion of women's hammer throw and pole vault. After all, the need for 40 or more active nations seemed achievable for a new event that could be offered without the expense of new equipment and facilities -- always a consideration outside of rich nations. For seven years, 1988 through 1994, women steeplers competed with the same 91.4cm barrier height used by men with a compensatory decrease in distance -- 2000 meters instead of men's 3000m. Then continuity was lost. The USA steeplechase rule was changed, effective 1995, increasing the women's championship distance to 3000m and lowering the USA women's barrier height to 76.2cm (30 inches). The IAAF made the same changes in its 1996-97 rule book, and they were in effect for the 1998 Goodwill Games in New York where Russia's Svetlana Rogova won in 9:57.62. However, international results suggest that wider adoption proceeded slowly until 1999. And years later some nations had still not made those changes in distance or barrier height. The slow adoption was due in part to the necessity for design, construction, and acquisition of barriers that could be adjusted vertically to accommodate the different heights for male and female steeplers. An alternative solution, observed at Indianapolis, was provision of two different sets of non-adjustable steeple hurdles -- with different heights for men and women. Another variation was briefly advocated: lowering the height of the water jump barrier, for women, to 68.5cm (27 inches). But rules state that the water jump barrier must be the same height as the steeple's on-track hurdles. That rule invalidated from best marks lists the times at the 1999 USA Championships where, unknown to many contestants, the barrier was lowered to 68.5cm shortly before the race start. Universal acceptance of female steepling was slowed by the expense of women steeplers different equipment that may be used only minutes each year at some venues. That expense could be handled by big USA universities with large budgets but not by smaller schools or poor nations. The loss of continuity postponed the vision of Olympic women's steepling. The new goal became 2004 in Greece. But that new continuity timeline was itself disrupted by yet another steeple rule change, requiring more expense: a shorter water jump for women, 3.06m (10 feet) rather than the standard 3.66m (12 feet). Although women of grandmother age cleared 91.4cm barriers and a 3.66m water jump in the 1989 World Veterans Championships, years later it was alleged that less-demanding obstacles were needed by younger, stronger, taller women athletes. Supported by some USA college and university coaches, a "short pit" could accommodate women with atypical physiques and it may have contributed to an increasing number of women in USA schools who attempted steepling. The "short pit" was authorized by IAAF rules, from 1999 to 2001, and by NCAA rules from 2001 through 2004. But the USA collegiate expansion seemed not to be mirrored internationally. Incremental changes, each with expense, did not encourage a similar expansion in the number of nations adopting the women's new equipment. It seemed for awhile that getting 40 to 60 nations to adopt women's steepling, and achieve subsequent inclusion in the Olympics, was a fading hope. The trend toward decreasing the event's demands led to some other oddities. In the 2001 USATF Junior Championships, the pit length was only 2.92 meters and the water jump barrier height was only 72.5 cm. For athletics statisticians the women's steeple had become a nightmare -- with marks from facilities of varied dimensions, variances that were seldom reported in official meet results. For several years, considerable resources were needed to investigate marks before their inclusion in rank-ordered lists of best performances. Then in late 2001 the IAAF returned its rulebook water jump requirement to the same 3.66m length for both men and women, matching the 2001 USATF rulebook. That was followed by an increase in the number of nations adopting women's steeple. By 2004 more than 60 nations had established national records for women's steeplechase. An increasing number of lady athletes now compete in the event. Results are reported from many parts of the world. And, effective 2005, the NCAA rules no longer include a 3.06m water jump "alternative for women". These positive steps were too late for lady steeplers to get their event in the 2004 Olympics at Athens. However, the IAAF added women's steepling to the 2004 World Junior (under age 20) Championships and the 2005 World Championships. 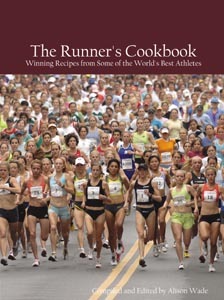 At the end of 2004 the world record for women's 3000m steeple stood at 9:01.59 by Russia's Gulnara Samitova. In January 2005 the IAAF announced its addition of women's steeplechase to its IAAF World Rankings program, a step that could increase the number of Grand Prix meets offering the event. There is solid hope for women's steeple at the 2008 Olympics in Beijing. Although inclusion in the Olympic Games has remained a goal, one that may be achieved after 20 years, it is gratifying to note that many nations now have developmental programs for young girl steeplers -- using both the original 2000-meter global standard and the increasingly popular 1500m steeple. Australia and New Zealand were reported as early leaders in youth steepling with many opportunities for competition -- and contestants as young as age 11. Now Canada, Europe, and USA report similar programs. Female steeplechase competition has a new continuity and a bright future.